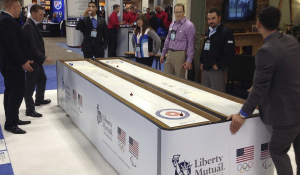 Let our experts design a sports-themed booth that fits your next show. We stock a variety of sport games and equipment including shuffleboard, corn-hole, volleyball, hockey, basketball Pop-A-Shot, MLB speed pitch, NFL quarterback challenge and mini golf. What’s more, we can integrate this equipment with a sweepstakes program or comprehensive booth/show theme to really WOW the audience while playing to the competitive nature in all of us. Take a look at the curling tables we customized for a Winter Olypmic themed booth. 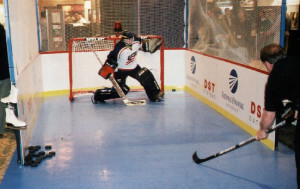 Or, maybe you’d prefer a one-on-one hockey shootout on a live goalie!